Resident members of the North Carolina delegation caucus during a 12-minute recess of the National Congress of Family Medicine Residents, discussing candidates on the ballot and resolutions on the consent calendar. Danielle Rushing, M.D., testifies during a resident reference committee hearing about her concern that patients miss important health screenings when they get vaccinations from pharmacists. 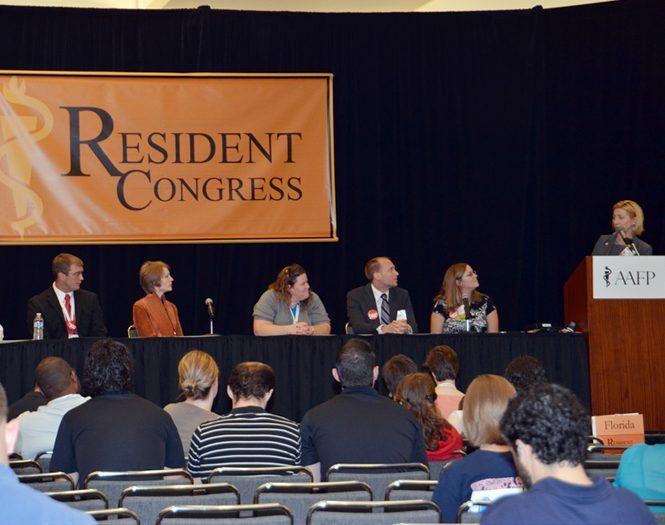 Resident candidates running for leadership positions listen to instructions from the moderator as a question-and-answer session is set to begin in the resident congress. A resident's testimony grabs the attention of many in the audience at a resident reference committee hearing on July 29. America's future family physicians have a passion for the specialty of family medicine and a desire to deliver the best care possible to their patients. 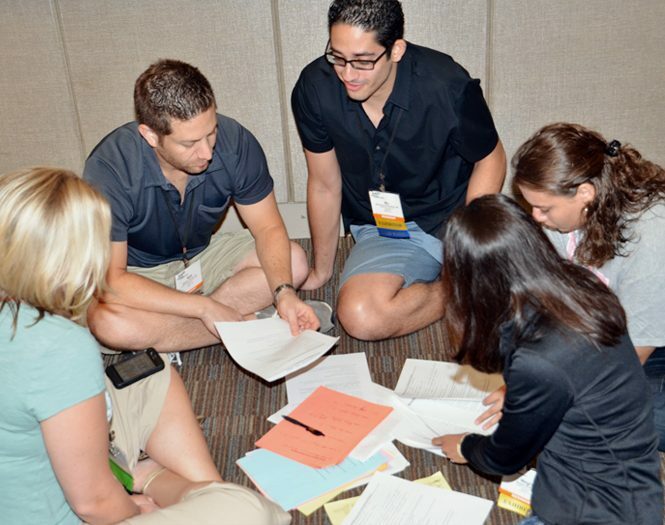 Those messages came through loud and clear in the resolutions introduced, debated and voted on during the AAFP's 2011 National Conference of Family Medicine Residents and Medical Students here July 28-30. Family medicine residents asked the Academy to work with state pharmacy boards to incorporate changes in vaccine policy when pharmacists administer patient vaccinations; the student congress also asked the AAFP to support research to find out who is receiving pharmacist-administered vaccines. Residents called for the AAFP to explore the feasibility of a federal primary care interest rate reduction program. A resolution that addressed the lack of primary care representation in the AMA/Specialty Society Relative Value Scale Update Committee was not adopted by residents but did spur vigorous debate. In particular, residents who participated in the National Congress of Family Medicine Residents asked the Academy to help create recommendations to guide pharmacies that provide vaccinations and explore the feasibility of a primary care interest rate reduction program for primary care physicians. Family medicine residents also debated a resolution regarding family physician representation on the AMA/Specialty Society Relative Value Scale Update Committee, or RUC, which is the committee that reviews and values CPT codes and makes payment recommendations to CMS. Lacey Millet, M.D., of Sulphur, La., co-authored a resolution that the congress adopted -- despite the reference committee's recommendation otherwise -- that called for the Academy to work with state pharmacy boards to require pharmacies to report vaccinations they provide patients to the patient's primary care physician; enter vaccines given into state databases, if applicable; and require pharmacists who administer vaccines to attend formal vaccination training. Millet testified in a July 29 reference committee hearing that some pharmacies offer more than just influenza vaccines, but she said the lack of pharmacy reporting requirements hinder the ability of states to collect vaccination information. "We don't know who is receiving vaccines," said Millet, adding that patients "are bypassing family physicians" in favor of pharmacies. "We don't know who is receiving vaccines," says Lacey Millet, M.D., because when a patient receives a vaccination at a pharmacy, the pharmacist does not report that information back to the primary care physician. 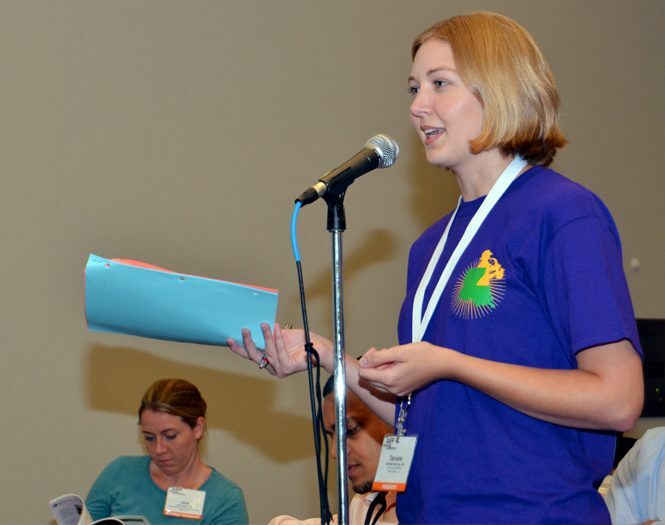 Millet introduced a resolution on the issue during this year's National Congress of Family Medicine Residents. Resolution co-author Danielle Rushing, M.D., of Lake Charles, La., testified that when pharmacists administer routine vaccines, patients don't get important health screenings they would normally receive in a primary care physician's office. "This is a major concern," said Rushing. Jill Campbell, M.D., of Anchorage, Alaska, stepped to the microphone and said simply, "Pharmacists have no training in giving vaccines." Although they adopted the portion of the resolution that pertained to reporting requirements, residents at the congress did not adopt another portion that asked the Academy to support research into populations that were receiving vaccines from pharmacies. The National Congress of Student Members, however, which considered a similar resolution, did approve a substitute measure that included a request that the AAFP support research into who was receiving pharmacist-administered vaccines. Margarette Shegog, a student member from Dayton, Ohio, said in a student reference committee hearing that a lot of pharmacies now are giving vaccines without notifying treating physicians or documenting the administration of vaccines in patient registries. "We feel we should know what is going on," said Shegog. "Moreover, there are more states that are starting to do this, and we would like the AAFP to be on the boat before it leaves us." Student member Margarette Shegog testifies in favor of a resolution that asks the AAFP to support research into populations that receive vaccinations from pharmacies. Residents also adopted a substitute resolution aimed at exploring the feasibility of a federal primary care interest rate reduction program. Mohammad Shahsahebi, M.D., of Raleigh, N.C., introduced the resolution. He noted that interest rates for federal medical school loans are higher than the current market rate for private loans, and he suggested that high interest rates likely were the product of loan restructuring efforts undertaken several years ago, as well as the recent economic downturn. Shahsahebi testified in the resident reference committee hearing that the availability of lower interest rates for those who choose to pursue primary care specialties could help increase the number of primary care physicians. This kind of loan program "could possibly create downward pressure on physician subspecialization if federal loans to primary care physicians were offered at a lower interest rate," he said. "We need to move forward with this now before all of the health care legislation is enacted." Resident Mohammad Shahsahebi, M.D., tells a resident reference committee that medical students are paying high interest rates on their student loans and suggests that the creation of a low-interest loan program for primary care specialties could help solve the primary care shortage. 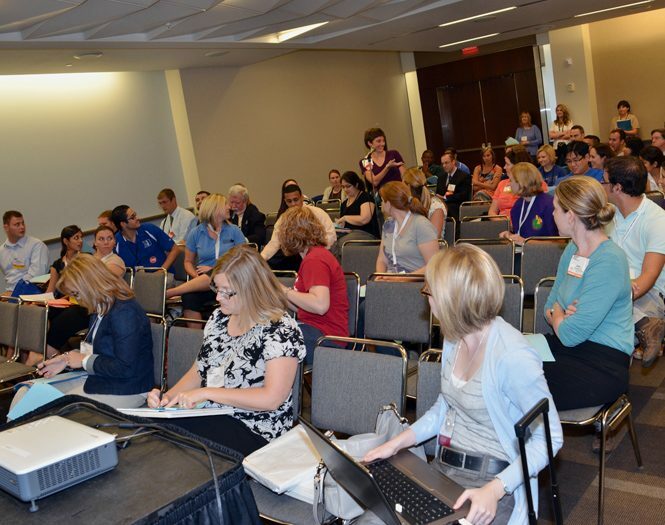 Some of the liveliest debate in the resident congress came in response to a resolution introduced by Christopher Baumert, M.D., of Billings, Mont., that asked the Academy to formally withdraw from the RUC if the committee did not implement recent AAFP recommendations regarding voting transparency, primary care representation and third-party engagement. Baumert was the only resident who rose to support the resolution. In reference committee testimony, Janet West, M.D, of Pensacola, Fla., said, "I've seen what happens when physicians step away from the table; it ties our hands when it comes to making meaningful change. It's not appropriate to say we need more representation and then pull out when we don't get it." Leslie Dempsey, M.D., of Lincoln, Neb., agreed that representation on the RUC was unbalanced, but said she could not support the resolution. "I will advocate for more primary care representation on the RUC until I'm blue in the face. But a small voice on the committee is better than no voice at all," said Dempsey. Brent Smith, M.D., of Brandon, Miss., put it this way: "The 'take my ball and go home theory of diplomacy' leads to one of two things: You get invited back to play or you're home alone with your ball." support civil marriage equality for same-gender couples to contribute to overall health and longevity, improve family stability and benefit children raised in families with gay, lesbian, transgender and bisexual parents.